Pasta dishes are the perfect comfort food. And we need easy, packed with flavor dishes in the kitchen. 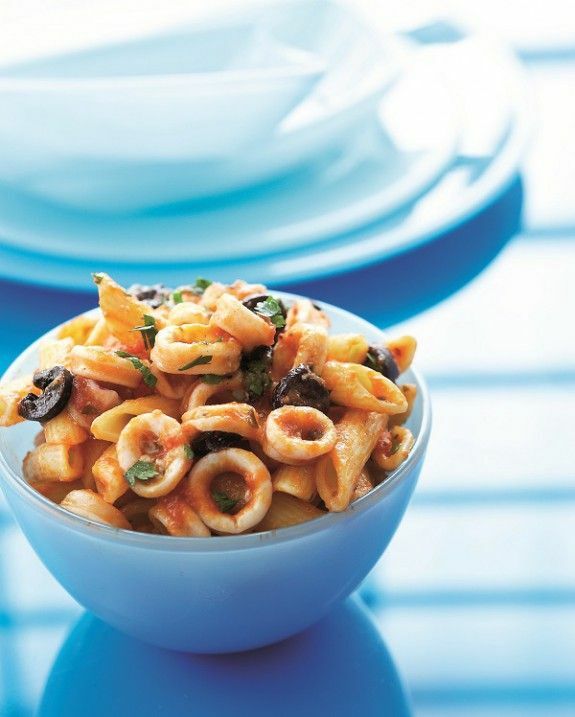 This squid and tomato sauce penne ticks all the right boxes in that regard. Why? It comes together easily and is the tastiest dish to retreat to the couch watching your favorite TV series. With a glass of wine too perhaps, you would feel grand! Cook pasta al dente, drain and reserve 1 cup of the boiling liquid. In the meantime, in a large non-stick pan, on medium heat, heat oil and cook onion and garlic until softened, for 2-3 minutes. Add tomato paste and cook for 30 seconds, then stir in fresh tomatoes and allow to boil. Add wine, black pepper, sun-dried tomatoes, chili pepper, half basil and half parsley. Turn heat down to low, cover with lid and cook until sauce thickens. Stir in olives 2 minutes before you remove pan from heat. Season with salt according to your taste but be careful because olives and sun-dried tomatoes are salty on their own. Discard chili pepper. In a third non-stick frying pan heat 3 tbsp oil and cook squid until just softened, for 4-5 minutes. When pasta is ready transfer and toss with the sauce. Stir in squid, remaining herbs and toss again. Serve immediately.